Heat 1 1/2 tbsp of ghee and fry the raisins on low heat until they puff up. Remove and keep it aside. In the same pan, fry cashew nuts until golden brown. Keep aside. Add milk to the carrots and pressure cook till 1 whistle. Once the pressure subsides, open the cooker and cook on high flame stirring continuously until all the milk evaporates. Add sugar and continue to cook on medium flame until the mixture isthick. Add a tbsp of ghee and cook for further 3-4 minutes stirring continuously until the mixture thickens. Add little grated unsweetened khoya at this stage and cook for few more seconds for a creamier texture. Add cashew nuts, raisins, elaichi powder, mix well and cook for another minute. 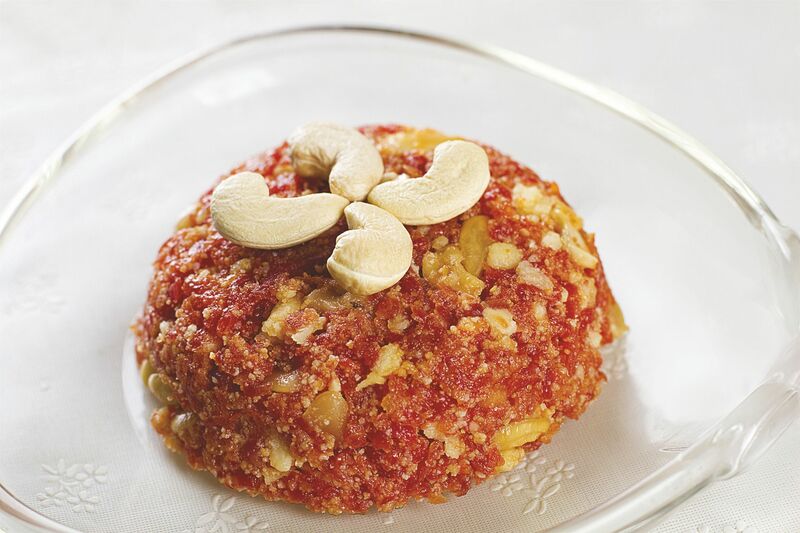 Serve gajar ka halwa hot or warm.